Spring is right around the corner and flowers on a breakfast table are always a lovely sight. Forcing paperwhites indoors will give you a delightful splash of spring color in just a few weeks. The project can be done in soil or in water and the kids will love to help. My bulbs have been blooming outdoors for a few weeks. Since the weather outside is cold now, I knew that I wanted some blooms indoors in a few weeks, so I decided that these pretty white flowers would be just the thing. 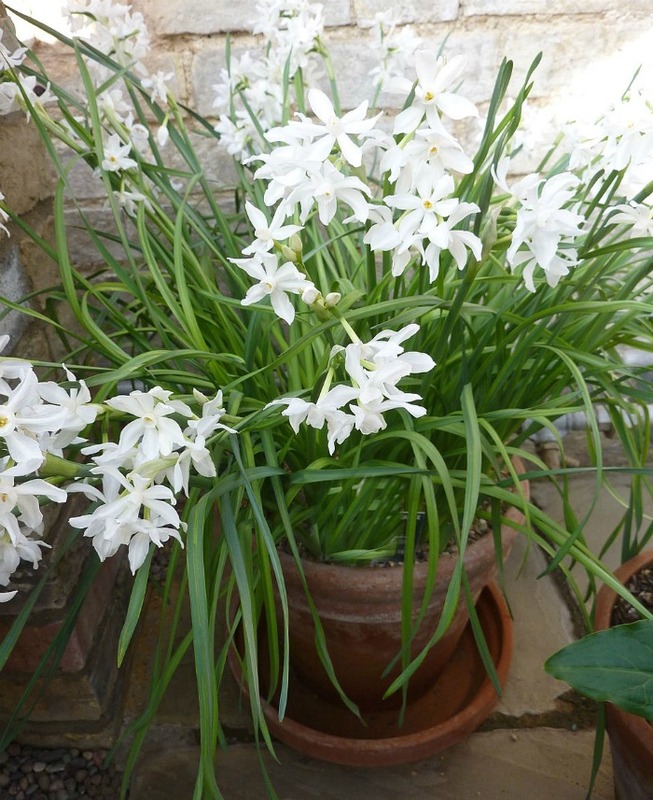 Paperwhite Narcissus bulbs are very easy to force and can be done any time of the year. Many people force them over the holidays to get blooms when gardening is not possible outside. I thought that now would be a good time to get some of them going in the house to remind me of what will be coming soon, outdoors. Paperwhites are very easy to force. 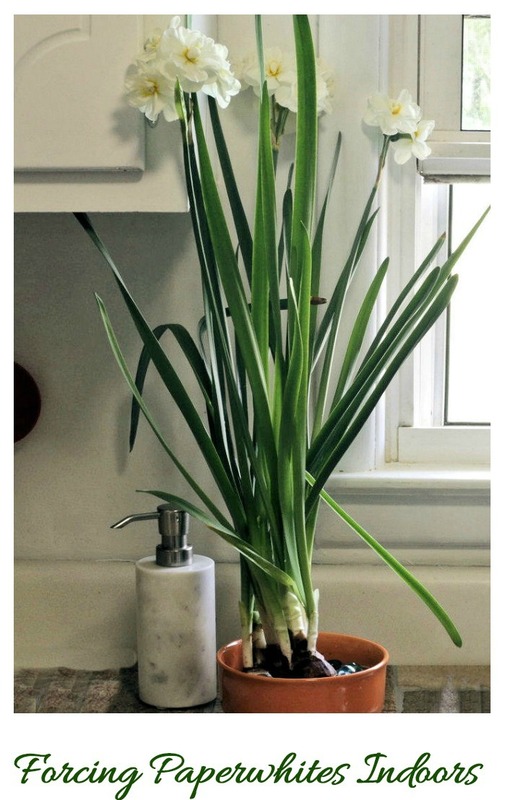 They don’t need a chilling period like other narcissus so the project is as easy as “just add some water and wait.” They will happily grow indoors in a bowl with nothing more than rocks and water. 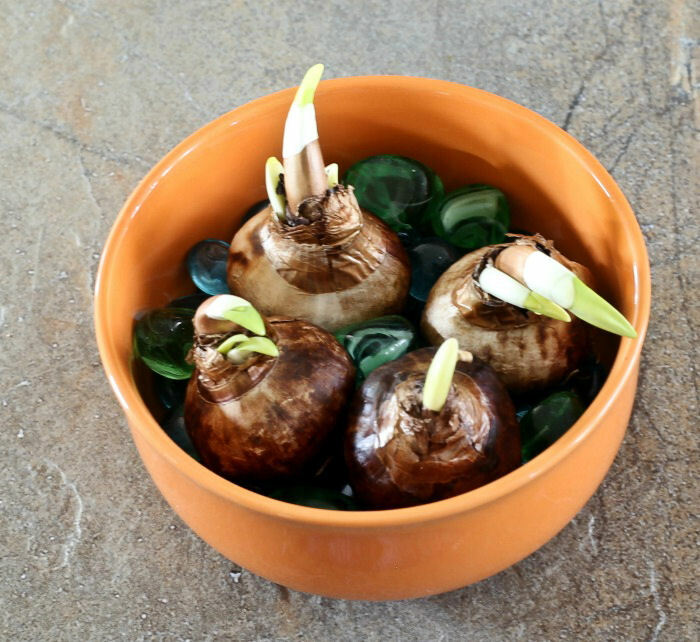 Forcing bulbs indoors is a great gardening project to do with kids. The stems and blooms grow quickly and the kids will be delighted to watch them progress. 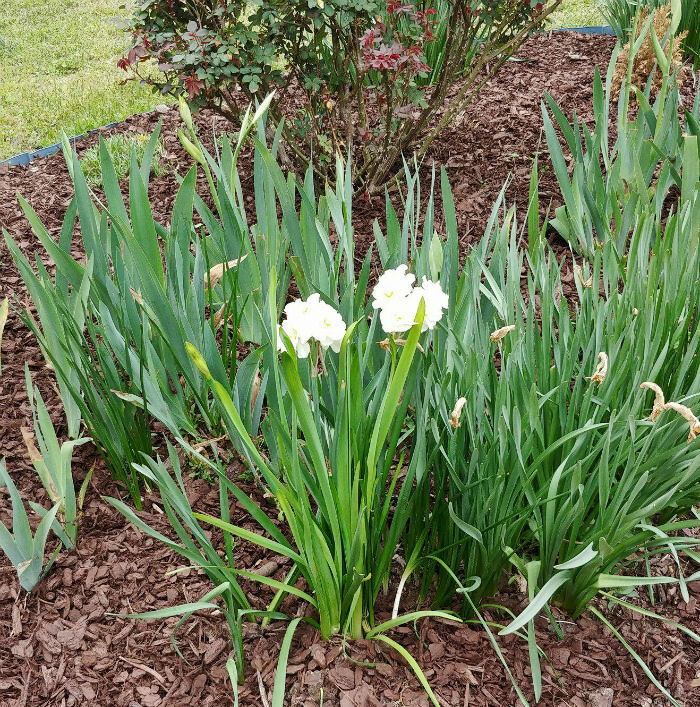 You can force paperwhite narcissus bulbs in either soil or water. I went the water route. I have a pretty orange bowl that will be a nice contrast to the stark white blooms and some pretty glass rocks to add to the bowl, as well. 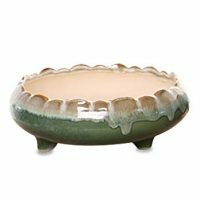 A shallow bowl about 4-5″ tall that is the size that you need for your bulbs. I only had four bulbs, so mine is about 5 inches in diameter. I bought some bulbs last fall, intending to force them for the holidays but, of course, forgot about them. When I dug them out, I discovered that they were getting impatient and had started to sprout. All the better! They’ll be flowering indoors in no time at all. 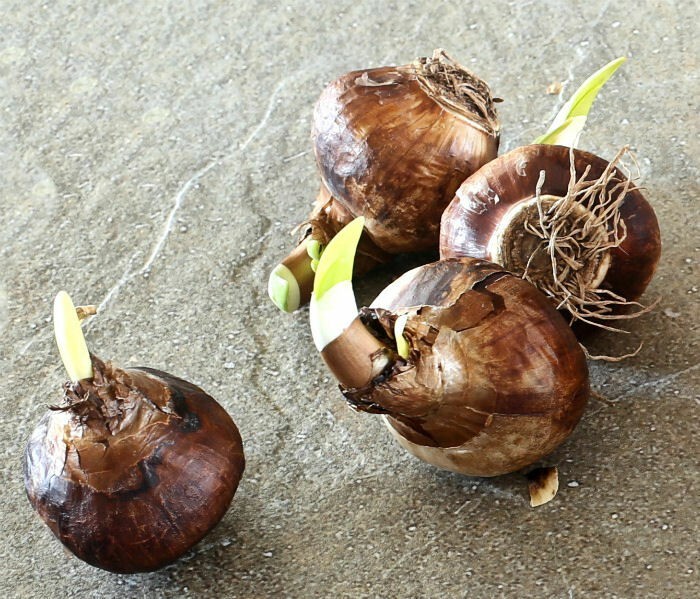 Choose large bulbs if you are using them to force indoors. The larger bulbs will usually produce more and larger flowers. 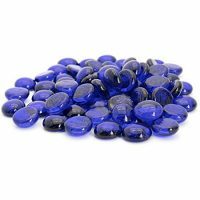 Start by lining your container with an inch or two of the glass rocks. Be sure that they are very clean since you will have roots growing around them. 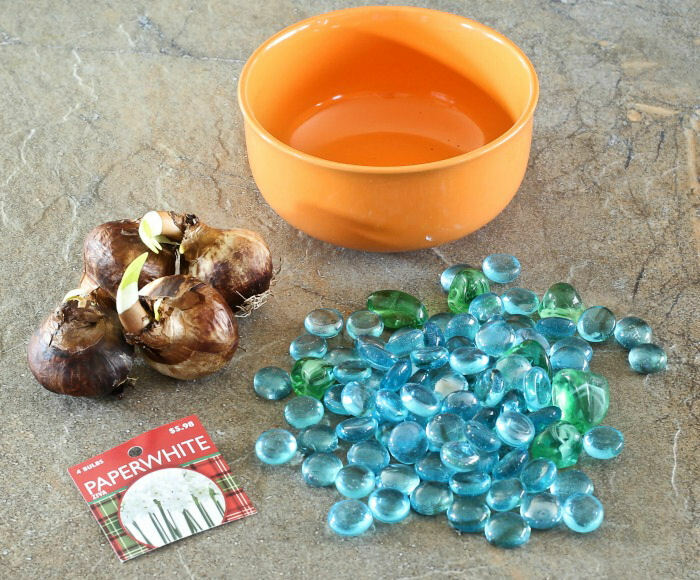 Place the paperwhite narcissus bulbs with the pointed end up on top of the layer of stones. Push them down a little to get them seated and plant them closely together to keep them from toppling over. Once you have them situated the way you like them, all some more rocks to cover the gaps. This will help to secure them. Don’t bury the bulbs completely though. Now it’s time for the water. Just add it in the bowl so that the level reaches the base of the bulb. 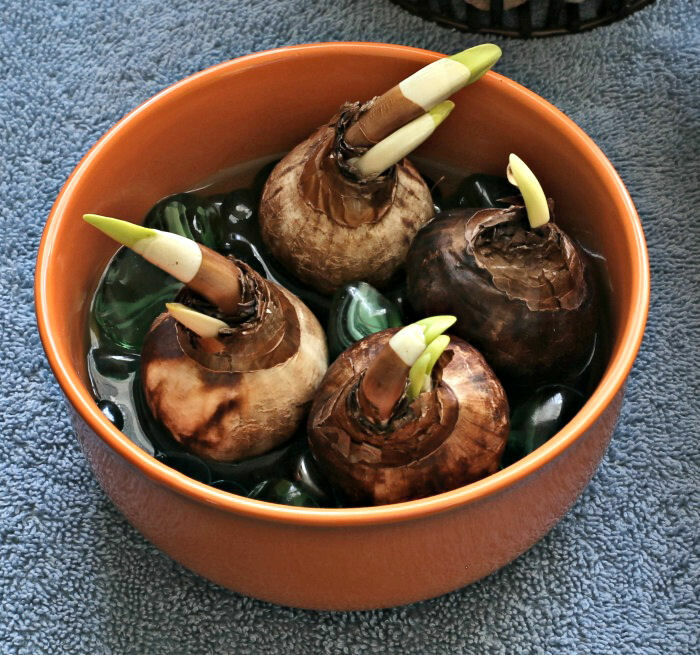 Having the bulb in water stimulates the growth of the roots and gets the bulbs going. Be careful not to bring the water too high on the bulb, or it will rot. Keep an eye on the water level to make sure that it stays up to the bottom of the bulb. Add more water if you notice that it is dipping below the glass rocks. Place the bulbs in a cool and fairly dark spot. I put mine in a North facing window near a peat pellet seed starting tray project that I have going on right now. When will the paperwhites bloom? You should notice roots sprouting within a few days of planting. Once the roots start to develop move the container to a sunny spot. Try to still keep the temperature fairly cool if you can. If the bulbs get too hot, they will also get leggy. It did not take long for the roots to start growing on the bulbs. I lost one bulb (it rotted early on) but the three that are left had great roots growing in just about a week. 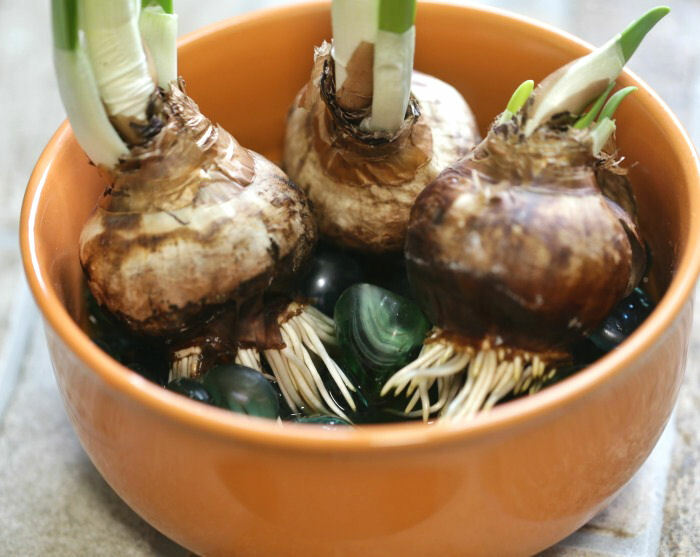 Shortly after the roots emerge, your green shoot will emerge from the top of the bulb. Now is the time to move the bowl to a sunny spot. The stems started to straighten up and in just two weeks, I had two really nice stalks growing from the bulbs and one straggler that has roots but not much growth. Remember those growing tips that were so crooked? They straightened up just fine! In 4-6 weeks, you should see your first blooms. It’s best to give them indirect light once the flowering starts so that they will last longer. The stems of paperwhites will grow quite quickly, during the last few weeks. If your container is short, you may find that the stems will need staking thick bamboo skewers or chopsticks work just fine! Just secure them to the stem with a twist tie or piece of ribbon or thread. 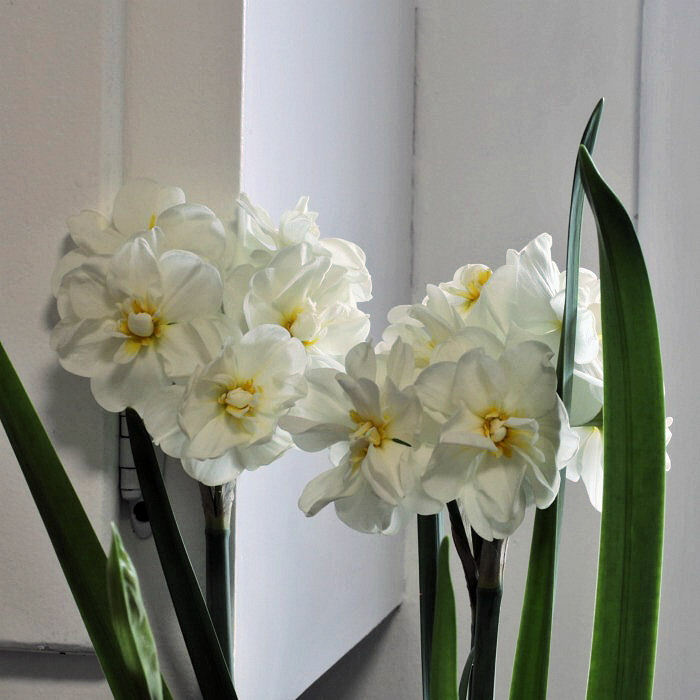 The blooms of paperwhite narcissus are pure white with a small inner throat, which is sometimes white, rimmed with yellow or with yellow stamens. Sometimes the whole inner throat is yellow. They grow on long stems. The center portion is not as deep as those of their daffodil cousin. Each stem will hold several flower heads. The blooms should last for about 2-3 weeks. Some people can’t stand the smell of paperwhites forced indoors. One type – Narcissus ssp papyraceus ‘Ziva’ has the strongest smell of all paperwhites and has even been dubbed “Her Stinkiness”. Some gardeners love the rich fragrance and others don’t like it at all. Not all paperwhites smell, though. There are some sweeter smelling varieties such as ‘Geranium,’ ‘Inbal,’ ‘Erlicheer‘ and Cheerfulness’ as well as others that are worth trying if the smell bothers you. 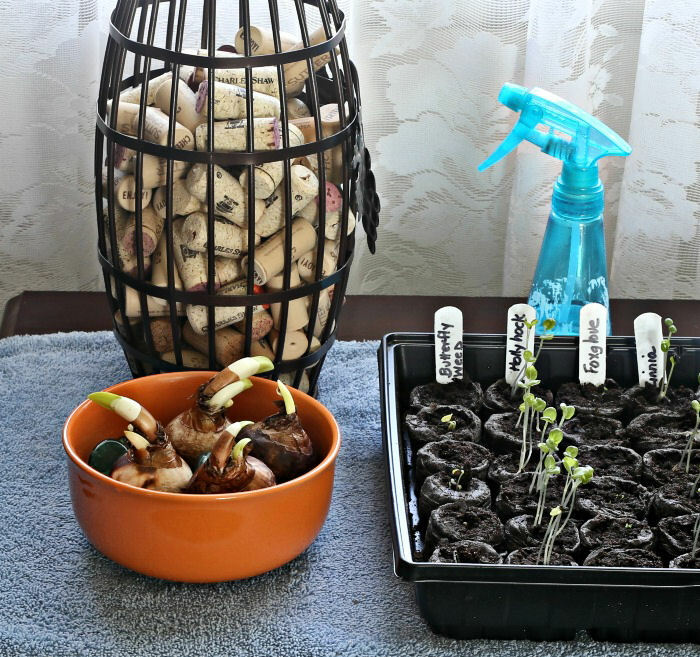 Since it will soon be spring, if mine start to stink, I’ll just place them outdoors or near an open window! To force paperwhite narcissus bulbs in soil, you will need a deeper container with drainage holes. 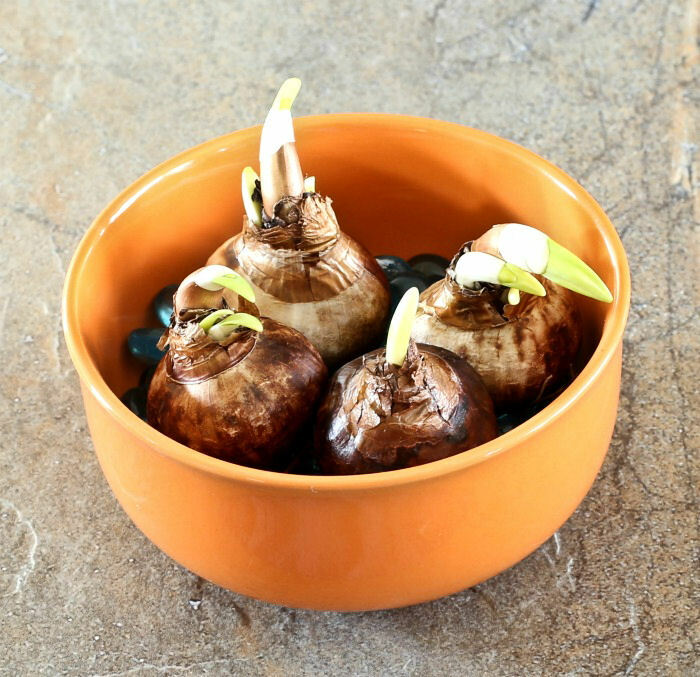 Fill the pot with good quality soil and plant the bulbs about 1 to 2 inches apart. Set in a cool spot for two weeks and then move to a sunnier spot that is warmer. Keep the soil evenly moist. The growth will be similar to bulbs forced in water. 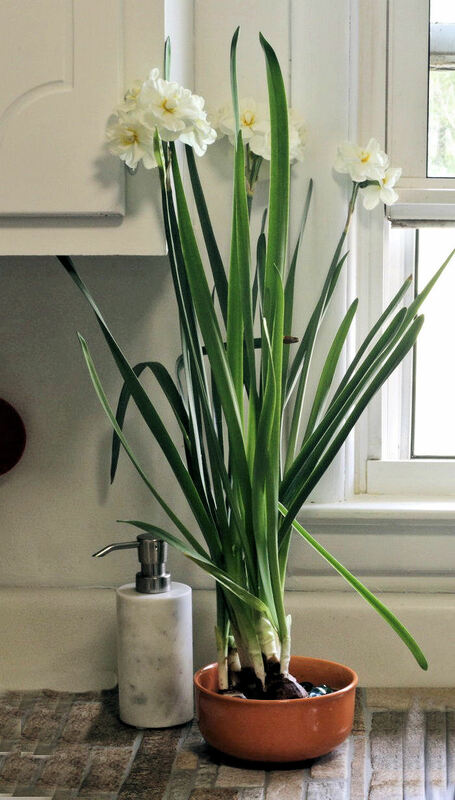 What to do with your forced paperwhites after they bloom? 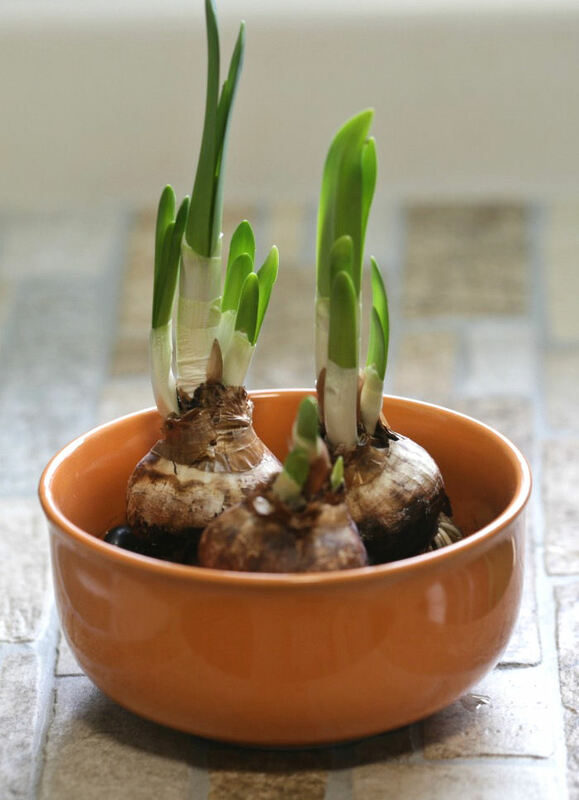 If you grow your paperwhites in soil, you can use them another year. Once the blooms of the paperwhites have faded, you can save the plant to bloom again next year. Just cut off the top section and place in a cool dark spot and bring them out again the next time you want to see some more blooms. You will usually get two additional years out of the bulbs. Paperwhites grown in water and rocks don’t save as well. The reason is that water forcing bulbs zaps a lot of their strength and increases the odds that they won’t bloom a second time. However, I am an optimist, so I I just plant mine in the garden (just in case) and hope for the best for next spring. The bulb will stay in a dormant state until spring comes next year and you will soon know if they will flower again next spring time when the rains start. Note that they are not as cold hardy as their daffodil cousins, so they won’t stand freezing temperatures outdoors. If you live in colder zones, (below 20 º) the bulbs can only be used for forcing indoors. Forced paperwhites in a colorful container adds a pretty spring touch to any side table. Add in some Easter eggs and a pretty framed printable and you will have a cherry Easter vignette that is perfect for the holiday. It is not just bulbs that can be forced indoors. Many spring shrubs can also give you flowers in the winter. I tried my hand at forcing forsythia this year with great success. 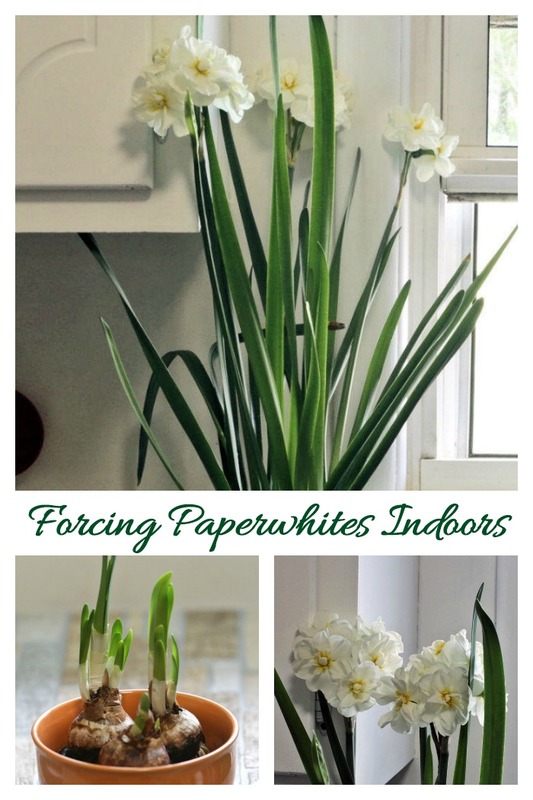 Have you tried forcing paperwhites indoors? Did you do it in water or in soil. I’d love to hear about it in the comments below. Admin note: This post for first appeared on the blog in April of 2018. I have updated the post to include a printable project card and a video for you to enjoy. 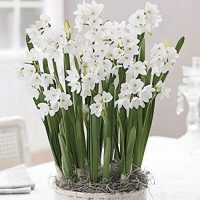 Would you like a reminder of this post for forcing paperwhites indoors? Just pin this image to one of your gardening boards on Pinterest. Forcing paperwhites indoors will give you a delightful splash of spring color in just a few weeks. The project can be done in soil or in water and the kids will love to help. 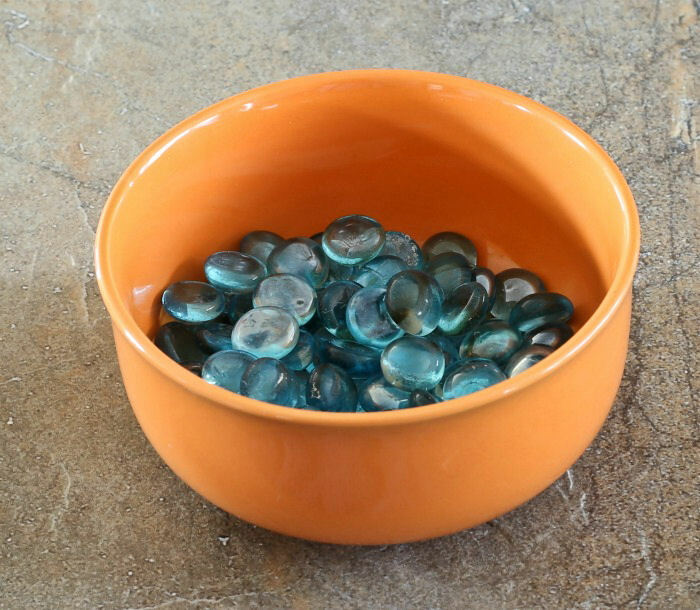 Line the shallow bowl with a layer of clean rocks, marbles or pebbles. Place the bulbs on the rocks with the pointed end up. Add more rocks to secure the bulbs but don't cover them. Water to the base of the bulb. Place in a cool and dark spot, such as a north facing window. Keep an eye on the water level so that it remains near the base of the bulbs. Roots will grow in a few days. Stems will grow in about two weeks. In 4-6 weeks you will have blooms.